Note that ‘Back’ of any street it listed under the main street name. Daubhill area. Ran between Rothwell Street and Shaw Street, about where Ashbury Close is today. Was in the area where Halliwell Road meets Blackburn Road, just above Egyptian Street. Aspden Street was one of several short streets that linked Moss Street and Victoria Street – both of which also no longer exist. Today the area contains modern housing running off Kentford Road. Daubhill area. Was near Fletcher Street and Edgar Street, behind the old railway station goods yard, there’s now an Aldi on the site. Ran off Quebec Street and into Delph Street. Now playing fields bordered by Quebec Street and Edward Street. Ran off Lever Street, near to Robin Hood Mill. Grecian Street is now part of Grecian Crescent. Ran between Parrot Street and Derby Street at the end of Bantry Street heading in the direction of Pilkington Street (see photo below). Was replaced by new streets of houses in the 70s and 80s. Ran between Quebec Street and Gibbon Street, just north of Burnaby Street. Now playing fields bordered by Quebec Street and Edward Street. Was partially demolished by German bombing duringWW2, the rest of the street was demolished in 1965 to make way for the Bolton Institute of Technology. It ran between Deane Road and Derby Street, directly opposite Fletcher Street. The site is now part of the University of Bolton. Demolished in slum clearances in the 1950s. It was located between Coe Street and Foundary Street. It and all the surrounding streets have been demolished and the area remodelled. It was located above Queens Park, near to Vernon Street. Ran off Mayor Street, parallel with Wellington Street, between Deane Road and Queens Park. Today the area has completely changed and been replaced with new housing and industrial units. Ran in between and parallel to Parrot Street and Bantry Street (see photo below). There are 70s houses there today. Ran between Rix Street and Walley Street, roughly where Pinewood Close is today. Was located off Deansgate, near to the present Market Hall, around the Crown Street and Bridge Streets areas. The area was a collection of narrow passages and was demolished in slum clearances long ago. There is a description of living conditions in Taylor Brow in 1847. Ran between Quebec Street and Gibbon Street. Now playing fields bordered by Quebec Street and Edward Street. Ran between Nile Street and Coe Street on the south side of Bridgeman Street in the Daubhill area of Bolton. The street was demolished and replaced by industrial units. You can find some interesting old photos of Bolton at Bolton Worktown, which has Mass Observation pictures, recording everyday life in the late 1930s. St Mark’s Church and School which has photos and information of the old streets and buildings around the Fletcher Street area. Lost Pubs Of Bolton has a large amount of information and photos of Bolton’s pubs, which includes pictures of the streets the pubs were on. There are also a couple of Facebook groups that share old and new photos of Bolton – In and Around Bolton and I Belong To Bolton. Pilkington Street, Bolton in 1937, showing how the houses continued on past the school. 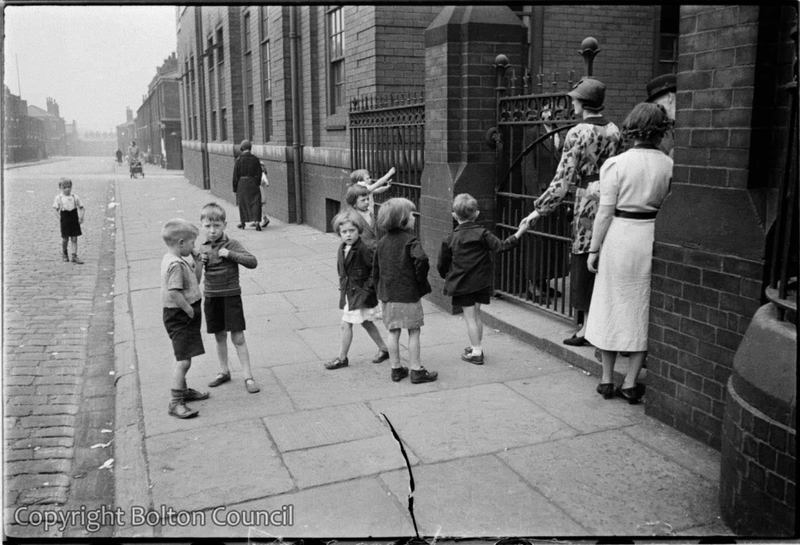 Taken by Humphrey Spender for Mass Observation, copyright Bolton Council. 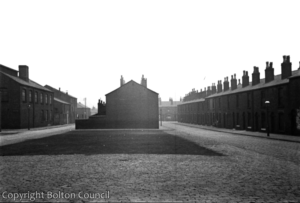 Looking down Bantry Street and Peel Street, Bolton towards Hammond Street. Copyright Bolton Council. Sydney St, Ran between Bridgeman st and Thyne St, I lived at number 19 then 46 and last was 110 . Number 46 was the old Lord Hill Pub, we ran a Guest house, and 110 was the General Havalock pub. Then I left and moved To Sydney, Australia. Thank you. That’s really useful. I have a relation born in Grecian Street and didn’t know where it was. I’m always fascinated by where people lived (almost as much as by who they were). My 2xgreat grandmother lived on Grecian Street in 1891. I am looking for Madeline Street Great Lever any help would be appreciated..
On the 1911 census, Madeline Street is listed as ‘off Hyde Street’, though I haven’t been able to find either on any old maps. The only Hyde Street I can find on a modern map is a small alley that runs between St Helens Road and Back St Helens Road (if that’s the same Hyde Street then it must have crossed St Helens Road in the past because it’s too short for any other street to have run off it). Sorry I can’t be of more help. If I do find a map that covers that area I’ll check again.